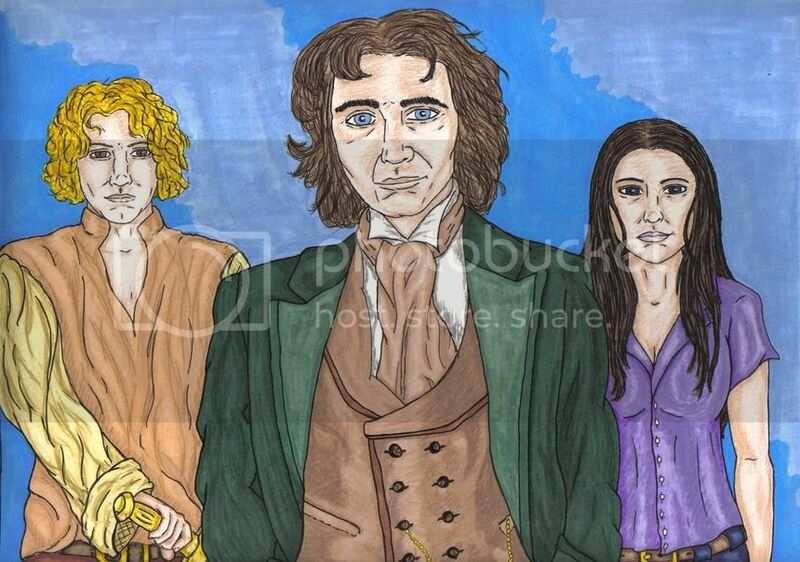 I did this little drawing last weekend as both a character sketch and sort of a promotional art for an upcoming series of Eighth Doctor fanfics I and my co-author are plotting and scribbling. I like to do drawings of the characters involved, especially original ones, so I get a good idea on paper what they look like. Anyhoo...this is the Eighth Doctor (and we all know who plays him), and two original companions -- Garion de Montfort (a knight from the thirteenth century) and Aeryn Watson (from the early twenty-first). And since I have zero clue how to post a picture here...clicky this link for the picture. Enjoy! And I have posted what I used as media up there too. Edit: Oh wait...I think I figured it out! Rats...it didn't work. Sigh. Ah well...the link above should. Thank you for the link to the pic! I look forward to reading the accompanying stories. In order to post a picture here, you need to have it hosted by a server like photobucket.com (1 gigabyte of space for free accounts). I can put it up for you, if you like. In order to post a picture here, you need to have it hosted by a server like photobucket.com (1 gigabyte of space for free accounts). You also need to use the link they provide in the square brackets (the IMG tag), as the regular HTML code won't work on the board. Oh I have photobucket, thanks! I just tried it via my livejournal scrapbook and got nothing. So let's try again, shall we? Like the eyes and the appealing color. Very good. Liking the colours very much.